Without going into many details about the past (tragic) events that have happened around the world and even right here at home, it can feel like we are being swallowed up by darkness. I know for me, I have to almost turn away from the news. Day after day it seems like there is something new and tragic and that all hope is lost. It causes me anxiety and I wonder what kind of world my kids are going to grow up in. But when I start to go down that rabbit hole and entertain the idea that there is no more hope, its like I'm also accepting the idea of a powerless God. Things might get worse or things could get significantly better. I hope for our worlds sake and our childrens sake the latter is true. But one thing I know for sure is God is powerful, God is greater than darkness and He is working for us, not against us. Let us all pray for peace and understanding in a world that seems hopeless. People are still good. There is still hope. Let us be the change in the world and the light for others! These little people give me hope! We just got back from Grandma's house which just happens to be at the Lake of the Ozarks. So it's definitely a win-win situation for us. It's a mini vacation for us and we get to see family. We were able to put our swimsuits on, go boating, and just relax in the sun. While watching my kids splash around in the water and soaking in the hot sun, it dawned on me that summer is finally here. It also struck me that Gavin is no longer a preschooler and officially a kindergartener. That's so crazy to me! It's so cliche but it feels like it was just yesterday that I was putting Gavin in diapers and soothing him to sleep. Now he's going to be going to school all day next year! I'm so excited for him to grow and learn but can't deny the feeling I get in the pit of my stomach when I think about him growing up. Sigh. I suppose I will save that thought for another post as I want to focus on the reason behind this post which is a summer routine! I've honestly never thought about having a summer routine as our day-to-day routine is a bit crazy. I can't help it! We are all a little laid back around here and mostly spontaneous. Which is nice but I can tell that the kids do thrive from having somewhat of a routine. Attend daily Mass at least once a week. Pick between educational app or show while Lucy naps. Play then bedtime. My goal is to have kids in bed by 7:45, hopefully sleeping by 8:30! See I told you, nothing too crazy or profound about my routine but now that I have it down and out there it will be easier for me to follow. Basically, I just want to make sure we are reading lots this summer and helping Gavin and Sophia get ready for school. My children are like Energizer bunnies. It's as if they don't need a lot of sleep which I know just isn't true. Gavin will have to be at school before 8 a.m. so moving his bedtime back is going to be a must if we're going to get there on time every day! Overall, I'm really looking forward to what this summer will bring and I'm looking forward to bringing more order into the household. I just hope I have enough discipline and energy myself to start this new routine. I don't know about you guys, but I don't really like change and I believe my kids don't really like big changes either. So pray for me as I try to start this new summer routine!! Do you have a summer routine? If so, what activities are your favorites? my kindergartener with his buddies. If you know me well, you know I am crazy about online shopping. When I say crazy I mean I'm obsessed with it. From ordering groceries online, to getting free shipping and 5% off with my Target card to Amazon prime...why would I ever have to leave the house?! Bliss! Okay, I exaggerated a little. Human interaction is pretty vital and I enjoy shopping and roaming around the store occasionally. But when I'm unable to go to the store or I need to shop for the kids I turn to my phone. I like to look for garage sales and rummage through the clearance racks. But with three kids in tow, leisurely looking around just doesn't happen. For example, Lucy is in desperate need for new pajamas. With the season changing fleece pajamas are pretty much like a mini sauna for her. So while looking online for cheap pjs, I stumbled upon an app called Kidizen. You can download this app for free and it's like a garage sale but online. 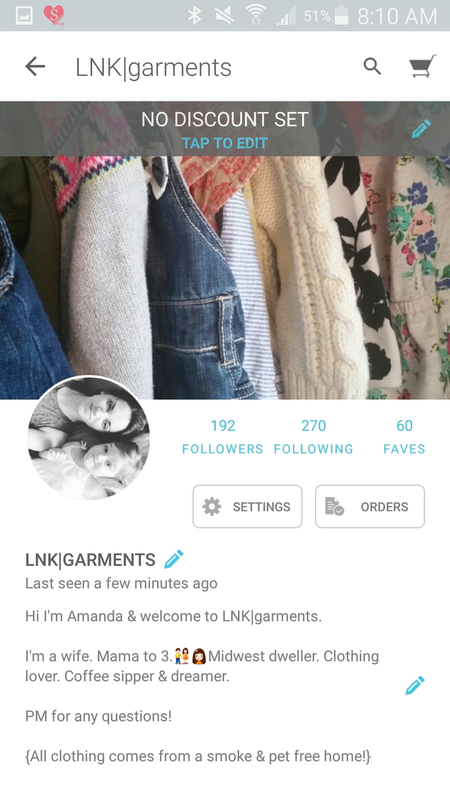 You can even open up your own "shop" by taking pictures of different clothes you are wanting to sell and loading them on the app. Other people can then go to your shop and purchase your clothes. Once they have purchased your clothing, you are able to print off a shipping label then simply drop the package off at your local post office. I can spend a lot of time browsing for clothes and shoes and other things on that app! The prices are a bit higher than a garage sale but the items sold on the website are in very good condition. So far I have sold a few items and have purchased a few items as well. For me, it has worked seamlessly. 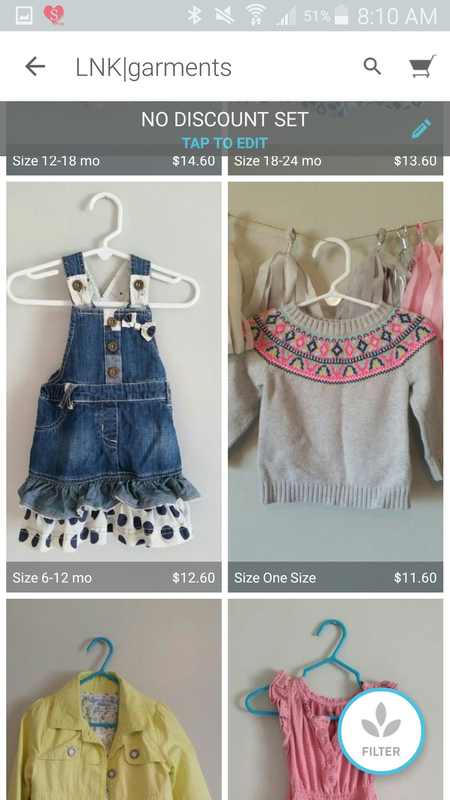 So if you are like me and you like to avoid the stores and order from the comfort of your couch check out Kidizen the next time you need something for your kiddos! Here are a few screen shots to give you an idea of how Kidizen works. Here's a look into my "shop" or LNK|garments. Once a person has found my shop they can click on the images of the clothing to get more details about the clothes. Above All the items listed for sale, there is a small profile about yourself. The more you put about yourself the more likely people are to buy from you. You can follow other shops and in return most people follow you back. It's all around us whether we like it or not. We can not escape hearing about it in the news, friends and family are talking about it. Politics. As we all know the big election is this year and if you spend any amount of time on Facebook during this time of the year it can cause you to want to deactivate your account or maybe throw your laptop against the wall. I think some have lost the art of having a true conversation about politics so although I am NO expert I decided to come up with a few suggestions on how to have an open minded conversation about politics with your family and friends. 1.) "Nope, not going there!" I see a trend of people's unwillingness to engage in a conversation when the conversation starts to head in a direction that makes them uncomfortable. It's important, especially when talking politics, to have an open mind while talking to others, letting them finish their thoughts out completely and taking turns speaking. We might be able to take away or learn a lot from others with differing opinions. Besides, if everyone had the exact same thoughts life may be a little boring. No? This one is hard...no, HARRRDDD for me. I speak fluent sarcasm but it's not always appropriate and doesn't really have a place when speaking to family and friends about politics. While jokes can lighten the mood and might be somewhat of a defense mechanism it can also communicate to all involved in the conversation that you aren't taking their thoughts seriously and are being dismissive. That can cause hurt and cause a divide in relationships. So although I may not agree or am "so over" the conversation at hand it's important to keep that eye roll internal with delicate issues. Political conversations almost always start out calm and can end in passionate arguments with almost no solution. I think it's important to continue a calm tone through out the conversation at hand. Try asking the person with differing opinions questions about their stances. Questions like, "How did you come to that conclusion about that candidate?" "What issues are most important to you?" Questions let the other person fully disclose information that you may not get otherwise, Knowing how and why a person came up with their decision may better help you understand their stance and that person. There is nothing wrong with getting your truths out there on the table, but just do so in a calm manner. Holy week is here. I feel like holy week can bring a lot of different emotions with it. Normally I feel like I need more time with Lent. More time because is it just me or is time flying these days?! (Perhaps a sign of maturing aka getting older? Maybe?) Anyway, more time because I'm just not fully prepared to enter into Holy Week this year! Yikes....I'm pretty sure that is what Lent is for. To prepare yourself, but for me...I need more time. However, time will continue to go by so with the time I have, I want to make the most of it! As I was looking at different kinds of things you can do to really get into holy week I came across this website: http://www.ewtn.com/faith/lent/holy-week-and-easter.asp I'm so glad I found it because it is such an easy way to observe holy week. For every day this week, there is a bible verse, a reflection, a Lenten fact then something called a Lenten action then a short prayer. I really like the idea of the Lenten action because it gives something practical that day to work on. For example, after today's reflection the Lenten action was to ask the Lord for forgiveness for all of your sins. Tuesday's Lenten action was call a relative that you haven't talked to in a while. Very simple actions that can mean a whole lot. I will be looking into doing this next year as well. Hopefully this is something that can help you out this week as well if you have been wondering how to make one last effort to prepare for Easter. On a different note, this time also is a time that causes me to reflect back on my journey into the church. I came into the church at the Easter vigil at St. Thomas Aquinas in 2009. I remember that night like it was yesterday. I was really nervous to receive the Eucharist for the first time. I was a ball of nerves about everything really, then something amazing happened. After I was baptized and confirmed I then received Jesus for the first time...and there was nothing but peace. Peace, happiness and it was really just a wonderful night. I had learned so much in RCIA and had so many people praying for me, SUCH a great time in my life. I pray you all have a blessed holy week and Happy Easter! This year our parish asked Matt Simmons who works for the diocese of Lincoln to come during Lent to talk about spousal prayer. So every Tuesday night Matt and I have gone to listen to Matt's words of wisdom on prayer. Matt worked with Matt Simmons during his time with FOCUS and as we have gotten to know Matt over time we knew these talks would be good. There are five different themes that we discuss each week. So far we have completed sessions 1-3 which were: Session 1: The Spousal Relationship, Session 2: Relational Prayer, Session 3: Spousal Prayer. The next two are sessions 4 & 5 which will be Marriage as a Ministry and Praying through Marital Pain. When we get there, Matt speaks on the theme for the night for roughly 30 minutes, then as a couple we go into the chapel and pray for 30 minutes in silence. After we are done praying we wrap the session up. Matt and I always leave these sessions feeling like we learned something new! I'm so glad we decided to go. At first it's always so hard to commit to anything isn't it? I know when Matt originally told me about this Lenten series our church was offering I was hesitant. Thankfully our church provides babysitting during the talks and it helped that we knew the speaker already. I think that's the way the devil works his way into my heart, especially when there is something for me to really benefit from spiritually. I immediately come up with so many excuses and I just don't feel like going. I feel like that's pretty common for others as well. Again, so glad I ignored those voices of doubt and decided to go. Like I said above we have gone over 3 sessions. In the first session we learned about the spousal relationship and how a relationship consists of two essential movements giving and receiving. I think the lesson I got out of this session was to remember to behold your spouse and see them for the gift God has given us. In session 2 we talked about relational prayer. Meaning, God engages us through relationship. Our response to God is an act of grace. Pope Emeritus Benedict XVI in "A School of Prayer" said, "Of course when we speak of prayer...it is necessary to bear in mind that it is an inner attitude before being a series of practices and formulas, a manner of being in God's presence before performing acts of worship or speaking words." The biggest lesson I got out of this particular session was a good reminder that we need to come to God in prayer with out all our "masks" on, God just wants to spend time with us and there is really no right or wrong way to come to Him in prayer. The last session we just had was about spousal prayer which has been my favorite thus far. Praying with your spouse can be awkward and almost impossible with young children around. However, if we believe that God is and should be our foundation...then obviously prayer is important to actually do on a daily basis and it's not something we should do alone...praying with our spouses is life changing. Matt gave some practical ways on how to begin praying with your spouse. You find a time when you both can be attentive to one another. For Matt and I (have I confused you on which Matt I'm talking about yet!!?? :)) this time is after dinner. The big kids get to go downstairs and watch a show while Lucy is with us in the living room. For a span of an 'Our Father', you just sit there and begin by recognizing that you are in the presence of God, a Father who loves you. One spouse shares their most significant or insignificant thing that happened to them that day. You are just sharing your heart here, the challenge is for the other spouse to JUST listen to the spouse talking. No commenting, no giving advice, nothing...you are there just to listen. After your spouse is done sharing, you then pray for them. It can be short and sweet or long,whatever is most comfortable to you. Then it's the other spouses turn. I think the most important step in all of this is to be patient with one another. Sharing is hard. Praying can be hard. Praying together can feel awkward if you have never done it before. Since this last session Matt and I have started sharing and praying for one another each night. (Or at least trying to do this each night.) Since we have started this, I can already feel us getting closer together and closer to God. It's just nice to share with one another and make time for one another. The days can be busy and long and pretty soon you may realize that you and your spouse haven't talked a whole lot. This is a great way to begin meaningful discussions and it's nice to hear my spouse pray for me. Again, I'm so glad we decided to go and learn more about spousal prayer. I'm excited to see what changes God will make in our marriage from this prayer! I thought I'd share some of my go-to lenten recipes that we make around here. I think these are our go to meals because A.) they are kid approved and your taste buds will thank you. B.) Each recipe has a nostalgic, feel good memory tied to it. First up is a creamy tomato tortellini soup. This soup served with french bread is a killer combo. I remember a friend making this soup for me shortly after Sophia was born. I remember feeling reallllly tired that day and reallllly thankful I didn't have to cook as we adjusted to life as a family of four. Tomato soup and grilled cheese is a favorite of mine, or at least it was until this tomato soup came into my life. When making this meal it takes me back to a tiny Sophia and a feeling of gratitude for good friends that want to take care of you in a time of need. Meanwhile, in a Dutch oven, combine the soup, broth, milk, cream, tomatoes and seasonings. Heat through, stirring frequently. Drain tortellini; carefully add to soup. Stir in cheese. Sprinkle each serving with additional cheese if desired. Yield: 10 servings (2-1/2 quarts). Next up is my mom's salmon patties. I'm pretty sure the recipe is right on the can of salmon but I'll share anyway. I remember eating this as a kid. Of course back then they were smothered in ketchup...well, who am I kidding? I still smother stuff in ketchup. But I just remember it being one of my favorite meals and I can see why my mom made it as well. It's super easy and takes no time at all. The last dish reminds me of Lent when Matt and I were dating! This recipe, well, not sure if I could necessarily recommend it. We more or less make it because it brings back memories of the dating days and Matt and I will eat just about anything! However, I'll share anyway. But don't say I didn't warn you...this is a weird recipe but again, it's super quick to make. The kids kind of liked it, but I think it's really good! It's a little messy so you'll need about 50 napkins and 100 if your kids are eating it! After dressing is mixed well, dump the tuna right in with it. Put the mixture on the toast (or you can grill the sandwhich as well) top it off with a slice of your favorite cheese and you are good to go! Sidenote:We also serve this with a side of fries...it goes great with it! Day 2 of Lent is coming to a close, do you know what you are giving up yet?! I'm kidding, kind of. Normally, I'm still scrambling to figure out what it is exactly I'd like to give up during Lent, but this year I was prepared. Surprisingly prepared. Thanks to Catholicicing.com and few other blogs I like to read! Lent is a time to simplify our lives, get rid of our attachments to this world and cling to God. For Lent this year we took a different approach and decided to do something as a family. As the kids get older I'm always looking for new ways to introduce each season the Church has to offer. Each year I can see that they are understanding more and more of what Advent, Lent and Easter are all about. It's so fun for my husband and me to see our kids just start to get it! There are SO many great ideas out there and although I gave up social media, mainly Instagram, I cannot deny it's power on giving us parents some amazing ideas on how to celebrate each liturgical season. Before we start to get too far into Lent I wanted to share what we are doing as a family for Lent. I got the idea from this website: http://www.catholicicing.com/lenten-activities-for-children/ This website has it all! So, if you need activities for the kids during Lent, click on the link. Anyway, this year I printed off the (free) Lenten countdown calendar. There was enough space to write in an activity for the next 40 days. For instance, on one space it says, "Pray for the Pope" on another space "No TV for the day". You can come up with whatever you want to do. At the very end, on Easter, instead of doing something or sacrificing something for the day we will then celebrate by picking an activity to do together. I'm sure it'll involve consuming lots of ice cream. Overall, I wanted to keep this Lent simple and special for the family. I wanted to do something that wasn't just for the kids. During each season I sometimes feel if I create something just for the kids, then the rest of the holiday or season I feel as if I'm policing instead of experiencing each liturgical season with them. This calendar seems like it will be good for everyone of all ages. As each day goes by we will cross off the day then talk about what we will do the next day. Usually, when the spaghetti is not being thrown all over the floor and the screaming is at a minimum, dinnertime is a good time to talk about the tasks that we get to look forward to. If this goes well this year, I can see this becoming a Lenten tradition. I'm also looking forward to a Lenten series of talks that our church is putting on. It's mainly over spousal prayer and communication. I will be sure to blog about the experience as we all could use some extra help in the communication department every now and then! I hope you all are having a great start to your Lent, God bless! Day 2 of Lent is coming to a close, do you know what you are giving up yet?! I'm kidding, kind of. Normally, I'm still scrambling to figure out what it is exactly I'd like to give up during Lent, but this year I was prepared. Surprisingly prepared. Thanks to Catholicicing.com and few other blogs I like to read! Lent is a time to simplify our lives, get rid of our attachments to this world and cling to God. For Lent this year we took a different approach and decided to do something as a family. As the kids get older I'm always looking for new ways to introduce each season the Church has to offer. Each year I can see that they are understanding more and more of what Advent, Lent and Easter are all about. It's so fun for my husband and me to see our kids just start to get it! There are SO many great ideas out there and although I gave up social media, mainly Instagram, I cannot deny it's power on giving us parents some amazing ideas on how to celebrate each liturgical season. Before we start to get too far into Lent I wanted to share what we are doing as a family for Lent. I got the idea from this website: http://www.catholicicing.com/lenten-activities-for-children/ This website has it all! So, if you need activities for the kids during Lent, click on the link. Anyway, this year I printed off the (free) Lenten countdown calendar. There was enough space to write in an activity for the next 40 days. For instance, on one space it says, "Pray for the Pope" on another space "No TV for the day". I wanted to keep this Lent simple and special for the family. I wanted to do something that wasn't just for the kids. During each season I sometimes feel if I create something just for the kids, then the rest of the holiday or season I feel as if I'm policing instead of experiencing each liturgical season with them. This calendar seems like it will be good for everyone of all ages. As each day goes by we will cross of the day then talk about what we will do the next day. Usually, when the spaghetti is not being thrown all over the floor and the screaming is at a minimum, dinnertime is a good time to talk about the tasks that we get to look forward to. If this goes well this year, I can see this becoming a Lenten tradition. I'm also looking forward to a Lenten series of talks that our church is putting on. It's mainly over spousal prayer and communication. I will be sure to blog about the experience as we all could use some extra help in the communication department every now and then! I hope you all are having a great start to your Lent, God bless! We are a couple of days into the new year and as always, it's so hard to believe. Did you make any resolutions? In my experience I have found that less and less people are making them. Throughout social media I have seen a lot of people picking out a specific word for their year and then really focusing on that one word or maybe even phrase for the year. An example would be using the word 'present'. Then that person may work on actually putting their phone down more and becoming more present with their spouse, children, co-workers...whoever. I like the idea of picking out a word for the year because it causes you to reflect on the past year quite a bit and allows you to figure out what you may need to improve on. Although, setting a resolution for yourself could be good if you have a type A personality. I think for some people picking out a word is not enough. They need to set a goal, work on that goal through out the year and then achieve it in order to feel like they have really improved. That would totally be my husband. Whether or not you're into picking out a word for the year or making some type of resolution I think doing any kind of reflection is better than nothing. I believe reflection is totally necessary for our spiritual growth. Let me explain. I think we can get really busy in our lives and without even knowing it we are putting God in a neat and tidy box and making checklists. I went to Mass-check, I said night prayers with my kids-check, I went to adoration-check...you get the point. We start to go through the motions and forget the WHY we do these things. The WHY is so important. The WHY is our story. There was a moment in your life where you reflected and realized there needed to be a change. Or maybe it was an experience in your life you had that caused you to change the direction of your life. We easily forget these moments that were so significant to us and it causes us to lose our way, lose the why. When we lose that, our desire to grow spiritually comes to a halt. I recently had this type of experience yesterday. I am a baptism leader in my parish along with my husband and a few other couples. We teach a baptism class 3 times a year and at the end of the year or beginning of the year all of the teachers of the class meet to discuss what's working, what's not working and if the material we are using needs to be changed. Fr. Kilcawley who is the Director of Family Life and Evangelization came to meet with us as well. During his presentation to us it was as if a light bulb went off and I realized I had kind of lost my why, my fire within me and have been just going through the motions spiritually and checking things off. After our meeting, my husband and I talked about the presentation and really reflected on what kind of people we were in 2015 and who we want to be in 2016. We were talking about spiritually where we wanted to be and what we can do to get back on track. Reflection is a wonderful thing and we often feel too busy to spend any kind of time doing it. But I encourage you to spend time with Jesus alone reflecting. Asking Him who He wants you to be in 2016, asking Him what are things you need to do less of and what things could you be doing instead? Asking Him to light the fire within you and find your story, your why again. I promise you if you spend time with Jesus reflecting on your life and asking Him to enter into those places you maybe haven't invited Him in yet...your life will change and 2016 could be the best year yet. May God bless you and your family this year! Another easy way to soak up Advent is by signing up to receive short meditations that can be sent to your email. It doesn't get more simple than that! You can sign up to receive these mediations made by the Live Greater Foundation by going to our Facebook group page (click HERE to be directed to our Facebook page) and sending us your email! For the kids I made a paper chain that had different bible verses that we could read out loud each day. Sophia and Gavin have been taking turns ripping the paper chain and counting down to Christmas. I got the idea off of Pinterest (no surprise there) and the verses are not super long which I love because the kids are able to pay attention to the verses. That was kind of my beef with the Jesse Tree...the bible stories were SO long and most of the time hard to explain to the kids. I think we will try and come back to the Jesse Tree when the kids are over 6 and are able to comprehend those stories a bit better. We also talk about the Advent candles and the wreath. I really love this more relaxed approach to Advent and Christmas. I feel like this will be a tear free Christmas eve (yay)and a more meaningful Advent and Christmas season as well. Another easy Advent tradition is an Advent calendar. Growing up my brother and I LOVED counting down to Christmas with an Advent calendar. I can remember getting excited about finding the day on the calendar and seeing what my chocolate would be behind the tiny paper door. A stocking? An angel? It was so simple, yet so exciting as a little kid. I'm glad we are continuing that tradition with our kids. What Advent traditions do you enjoy?! Hope you all have had a great start to week 2 of Advent! God bless! Happy almost Halloween and almost All Saints Day! My three littles will be trick-or-treating tomorrow as a tiger, princess and ladybug! I think the kids are a little confused by Halloween. I was talking about Halloween yesterday with Sophia and then the questions came flooding in. "What is Halloween?" "We dress up and get CANDY! Why?" I honestly didn't have a great answer for her. When you think about it, it is kind of a strange tradition. You dress up as anything else but yourself and go door to door asking for candy. On the other hand, if free candy is involved...I can see why people don't question this tradition at all. Whether Halloween is your jam or not, I hope you and your loved ones have a wonderful time tomorrow! Another holiday or more like feast day that is coming up that I like to take the time to recognize is All Saints Day which is celebrated on November 1st. I was inspired to do a cloud saint craft by catholicicing.com. I like this craft for younger children because it's a quick craft and all at the same time it makes that connection for the kids that the saints are up in heaven praying for us! I am a big believer in having an ongoing conversation with our kids about our faith and why we have certain feast days in the church. That task can seem so overwhelming but it doesn't have to be. This craft takes 10 minutes. Even if you just had some prayer cards lying around somewhere, putting them on the fridge on November 1st would also be a great way to recognize the feast day. Keeping it simple and sharing the faith with the kids...win win right there! Pumpkins and mums are showing up on front porches. The air has a cool crisp to it and apple pies are gracing our kitchens. (Well, for some of us!) This all can only mean one thing...it's officially fall! I really love the beginning of a new season. It's a fresh start and with each season brings exciting traditions. For us fall means a trip to the apple orchard, carving pumpkins and our annual Halloween party with neighbors. I normally shy away from all things Halloween because I really don't like anything scary. But I just can't help celebrating each holiday. I definitely find joy in creating decorations and even though Halloween isn't my favorite, we've gotta acknowledge it's presence. After all, who doesn't love seeing their kiddos all dressed up?! This year we will have a tiger, a princess and a lady bug. Below are a few scare free Halloween decoration ideas and some fall goodies we recently made with our apples from the orchard. I made a 'Boo' banner recently (See picture above) that took me all of 10 minutes to create. I printed off the letters from a website I found via Pinterest. I used some twine and black glitter and 10 minutes later...a banner was hung! I bought some bats from Michaels and also hung the bats on the banner. The kids got a kick out of the bats...added bonus to creating decorations...they sometimes entertain the kids for a long time. I never imagined that paper bats would be such a huge hit. Last but not least is our little stoop all decked out for the holiday. We plan on going to the pumpkin patch later this month for Sophia's birthday...so add a few more pumpkins and the outside decorations will be complete! I hope you all are enjoying fall as much as we are. God bless! A few months ago I was at my parents house and we busted out a huge tub of pictures. I love looking back at old photos of my parents and pictures from my childhood. As we were flipping through photos, laughing at the hair dos and bell bottoms it hit me that most people of my generation will not have this sort of experience. Think about it, we all have smartphones. Which is a great and super convenient way to document life. Our phones can hold thousands of pictures but that's the problem. Most of us just let those pictures sit on our cell phones. Then one day a warning pops up that you are running out of memory and what happens? You just start deleting the photos left and right to make room. After my family and I had finished up with the pictures I promised myself that I would get my pictures off my phone and print them off! First I went to Walgreens, but if you use the Instagram app to take pictures and then try to send them to somewhere like Walgreens, the picture is very distorted. I learned this the hard way when I decided to go to town and ordered 30 of my Instagram pictures. Let's just say it was a waste of a trip because every.single.photo was so blurry. A friend had told me about Chatbooks (click on link for more info. You can also use this code to get your first Chatbook for free: HQA4NHJG) If you're like me and use the Instagram app to take most of your pictures, Chatbooks takes all those pictures and puts them into a 60 page book. You can choose how many books would like to receive or subscribe to all the volumes of your Chatbooks.I thought I had heard somewhere that pretty soon you will be able to use the Chatbooks app to make picture books of the photos just on your regular camera on your phone. If that's true, that would be pretty great too. After receiving my first Chatbooks, I was really impressed and excited that now I was finally getting all of those precious pictures OFF my phone and into my hands! These would make great gifts as well! Speaking of books, we visited the library a few weeks ago. It had been a while since we had been there and the books we do have here at home we have memorized. It was time to get some new books! I've toyed around with starting a library series on here just because I really appreciate when other people share what they are reading. I'm trying to be a bit more intentional with the books I check out, only because in the past when I have checked out books at the library for the kids most of the time when we get home, the story isn't that great and the kids get over them pretty quickly. For this library trip I took the time and looked up kids books especially ones that I thought my kids would really be into. I also looked on friends blogs to see what kind of books they were checking out for their kids. After I had compiled my list, off we went! Here are some of the favorites below. It's been almost a month and the kids are still loving these books. I think being more intentional with the books I get really makes a difference. Normally, I grab whatever book looks appealing to me only to discover the storyline is a bit strange or the illustrations aren't that great. So...anybody have any book recommendations? Because I'm all ears! Gavin's favorite has been, "Rita's Rhino" and Sophia has really liked, "Goodnight Ark". I honestly have enjoyed all of them. "Chu's first day of School" was a great one to read the night before Gavin started pre-school. My little man is pretty reserved and gets intimidated by larger groups, so school is a little scary for him. I think this book helped him as Chu (the little panda ) is really worried about the first day of school, but by the end of the book ends up liking it! After the first day of pre-school Gavin told me he was just like Chu, he was a little nervous but then it turned out great. I really liked how the book helped Gavin identify his emotion and he was able to talk to me about it. Overall, this library trip was a great success and we are looking forward to the next trip back! For some strange reason once the fourth of July is over, I'm ready for Summer to end and Fall to arrive. Nothing like wishing your life away,eh? I just can't help it though. In fact, I already bought little Lucy a "I'm so cute it's scary" onesie. Yeah, I know...it's still July. (Insert slightly embarrassed emoticon here) So I may be jumping ahead here, okay....way ahead. Now that I've confessed my embarrassing purchase to you all, let's refocus on the present. Lucy is almost 5 months old, she is starting to get more predictable. I like predictable because that means I know when I'm going to have some free time during my day/evening. One evening, Lucy went to bed early and my husband put the kids to bed allowing me to get some DIY projects checked off my list. For a while now, I've been wanting to create some kind of chore chart for the kids. I stumbled upon another blog that had this great idea of creating chore magnets. (I wish I could remember which blog I got this idea from!) Anyway, I used the company Sticky9 which takes your Instagram photos and turns them into magnets. I also downloaded an app to my phone where you can add words to your photos. I created VERY simple tasks/chores for the kids to do. I created magnets that said things like, dishes in sink, get dressed, brush your teeth, etc. (See picture below) I came up with such simple tasks to begin with to get them used to the idea of completing chores. Once the kids have completed the chore, they have to put their magnet in the "done" box. Which is just a mesh magnetic box that I got off of Amazon. (Online shopping is a moms best friend.) At the end of the day if they have completed all their chores, I give them some change. The idea is to collect enough change by the end of each month that we can go to the dollar store and pick out something fun to reward them OR have them put it in their savings. I mean, if I were a 5 year old I would choose the dollar store every time. But don't tell Gavin that. Nothing against banks, but $1 stores are like going to Disney Land for toddlers. Or maybe just my toddlers because they are easily amused by all the trinkets the dollar store has to offer. Anyway, we are only on day 3 and it's already starting to look a little shaky. Day 1 and 2 were great. They loved putting the magnets in the done box and almost seemed giddy to complete their chores. However, tonight they did not receive any change because there were magnets left up on the fridge. I'm hoping they were just really tired tonight and just wanted to go to bed...because they didn't seemed too phased by my whole, "why chores are important speech". Uh oh! Oh well, I will continue to stick to my guns and try to do this magnet chore chart. After all, it's only day 3 and I'm excited to reward them at the end of the month. Next week we will be taking a family vacation to Colorado. So, I guess we will be away from the chores for a while. Including myself, which will be really great. So, I suppose I don't really mind jumping right ahead to next week because the mountains are calling my name! Our family plus my brother and parents will be staying in a cabin in Estes Park. I think it's going to be a really great way to close out the summer and get geared up for another school year. But before mountains, we have Gavin's 5th birthday next Wednesday! I (almost) have a five year old. F I V E. I know every single mother says this, but really, seriously, where does the time go? We will be having Ninja Turtle cake, playing with friends and I can't wait to give Gavin his Ninja Turtle pajamas that have a blue (Leonardo is his favorite) mask to go with it. We got him some other fun things for his birthday as well. But, I kind of love this age. You can give kids ninja turtle socks and princess underwear and they just think it's the coolest. So simple. For some reason I feel like pajamas as a present may not be as cool when Gavin is 13? I could be wrong? Who knows. Anyway...I guess you can see why I'm ready for this week to be over...so many great things to look forward too. Mountains, not having to do any laundry while staring at the mountains and best of all, celebrating my not so little boy's birthday. I pray you all have a fantastic close to your summer as well! God bless! I would consider myself laid back but those who are close to me know that I worry a lot! I think as I have more kids and the older I get, the more anxious I become. The news seems to be filled with one tragedy after the next and if you (lovingly) disagree with another person's point of view or opinion...you get labeled as a religious bigot/hater. At the end of the day there can seem like there's little hope for the world our kids will live in. She had suffered greatly at the hands of many doctors and had spent all that she had. Yet she was not helped but only grew worse. She had heard about Jesus and came up behind him in the crowd and touched his cloak. This woman had real faith and hope that she would be 100% healed and because of that kind of faith, God had mercy on her and healed her! In the confusing and frightening times that we live in, it can be easy to lose faith. But here's the thing we need to remember...we are not made for this world. No matter what happens, God is in charge and never changes. His love for us is infinite and He wants us to receive his mercy and special graces. He has overcome death and already won. As Christians, we need to remind ourselves that we are called to be a light in a world of darkness. So keep the faith always, have hope and know there may be a lot of darkness around us but there is so much good around us as well. May we start out this week thinking positive thoughts and trusting in Jesus' plan for us, our country and the world. We only need to have faith in Him and He takes care of the rest! Do you ever have one of those days where nothing seems to be going right? In fact, so many things happen in one day you just have to look back at the day and laugh? Well, I recently had one of those days where I started off the day pretty angry then ended up just laughing at everything that had happened. Sometimes the Lord makes it completely obvious that He's giving me opportunities to practice patience (say that ten times fast) and I still lose my cool and ask Him to kindly stop giving me these opportunities. I found the above image from Pinterest and it perfectly described how I was feeling that day! Prior to finding this picture, I decided to make a Target run. The kids were arguing, I needed to get a few things for dinner so I packed the diaper bag and off we went. All the way to the store the kids were for some reason pumped up about the "big" cart they would get to ride in. I don't know if you have seen the kids carts at Target, but they are massive. You can strap two kids in the front and then the actual cart is behind the kids. (I don't know how else to describe that...) So when you are going through the store, you are pushing the semi-truck of all carts. Naturally, I have Lucy in the carseat in one hand and holding the hands of my other two children in the other and that's when it happened...wouldn't you know it but there were NO BIG CARTS! NOOOOO! I tried to act like it was no big deal and that it would be really fun for Gavin and Sophia to just walk with mommy. The kids weren't buying it. Three feet into the store and tears started to well up in Gavin's eyes and Sophia was giving me that diva toddler death stare....uh oh. (Opportunity #1 to be patient) What was a mom to do?! Yep...go to the $1 bin at Target and find more junk to bring back to the house. I survived Target with a newborn and two children somewhat walking...more like constantly wandering off from me, but I survived. I managed to get two things from my list and the rest, well, the rest of the items from Target were clearly items that screamed, "Okay, okay....you can have that just don't run off in a million different directions." We left with items like dinosaur erasers, robot underwear and princess markers...oh my. When we got back home, I put a movie on for the kids and Lucy was letting me know that she was hungry. So as I was feeding Lucy, I sent Matt the patience picture that I posted above, telling him about my crazy trip to Target and how I didn't need the Lord to send me any more opportunities. Just as I finished sending Matt that text and picture, I was done feeding Lucy. As I sat and stared at Lucy, I was reflecting on the day and that's when it dawned on me. Sophia had opened up the refrigerator while I was nursing Lucy...but I had not seen her since she opened up the door. As I walked around the house trying to find my way too quiet toddler I stumbled upon this scene... Yep...that's Sophia with an entire bag of shredded cheese dumped out onto my bedroom floor. It was one of those moments that you are so shocked you are just not sure what to do or say. She flashed that smile at me with cheese hanging out of her mouth and I just laughed. As I was telling Matt about my day and how I didn't need any more things to happen...Sophia was in cheese heaven. I of course told Sophia how naughty that was and had her help me clean the mess up, but it still made me laugh. God works in mysterious ways and humorous ways to teach us lessons. That day, it was to look at the bigger picture and not get so upset at the small stuff. Who knew a Target kids cart (or lack there of) and cheese on the floor would set me off? You can't sweat the small stuff and you can't let events from the day dictate your feelings or emotions. You have to choose joy and that is SO hard! So let's pray for one another. Let's pray for patience, peace and less cheese on the floor. God bless! Now that Lucy is 2 months old, things are starting to feel normal again and normal feels good. I get that everyone's normal is different after having a baby, but it takes me about 2 months to get into a good rhythm. I'm glad I started to feel more like myself again because we had a lot going on this past month and the month of May looks pretty busy as well. The most exciting news in April would have to be Lucy's baptism. It was a great day filled with family time. Our family is spread out so it was nice to have my parents as well as my in-laws all under the same roof. To my surprise Lucy did well at the baptism. She slept through all of Mass and most of the baptism. I held my breath a little when Father poured water over her head, but she didn't make a sound! (My son was a different story, apparently washing away original sin wasn't his favorite. Or maybe the water was just really cold?! ) After the baptism we of course took 1000 pictures and out of the 1000 we took,the picture below was the best one. This month we celebrated my husband's birthday. He turned the big 3-0 this month. For some reason we were a bit more nostalgic with this birthday. I think when you are a kid, 30 seems really old. Practically 100...but when you are the one turning 30, you really still feel like a kid in some ways and you realize that 30 is NOT old. Definitely not old. For Matt's birthday I emailed/sent Facebook messages to family and old college friends asking them to send me their most favorite memory of Matt. I only intended to get 30 different memories, but our family and friends outdid themselves and I had at least 40 memories of Matt. I printed out all of the memories then put them in 30 different envelopes. It was a collection of memories of the past 30 years and they were so fun to read. It was a gift for Matt and myself in some ways. I really loved the memories of Matt as a kid. It just explains so much and I'm scared for my children now. Kidding! Overall, we have had a great couple of months and I'm so glad to be welcoming spring and soon summer. We have a lot going on this summer including a vacation to Colorado. Love me some mountains. I hope you all are doing well and if you have been feeling a little off lately, I hope you begin to find your normal again as well! God bless! Take time to read the Bible this week. Spend 20 minutes a day reading and meditating on the Scriptures. If you have children, read it to them and talk about it. Go on a walk after dinner, every day this week.